Extend WiFi Coverage At Your Property, House, Office or Anywhere. 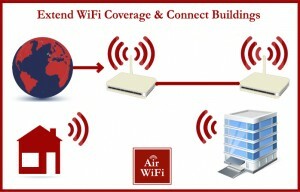 Extend WiFi Coverage at your property. More and more people are contacting us as the WiFi signal is poor around their house or office. There are many reasons for this and we can extend WiFi coverage for you. Moving service provider or changing your main router can change the WiFi coverage area in your building. Some materials used in your building can cause the signal to become weak or stop it getting to areas you need coverage. Materials that will affect your WiFi signal around your property include. There are plug and play products on the market that extend WiFi around your house. These devices can plug into an electrical socket and can be unsightly. Also when they lose power or you will have to reconfigure them again. This can be a daunting task as they are sold as plug and play they will most likely be simple to set up out of the box. Finally, when the extender has a problem so do you, simply because it is frustrating! You wouldn't leave personal documents around for everyone to see, would you? If you have a home office and would like to separate it from your domestic network. This will keep private files which are for personal / business away from friends and visitors who connect to your WiFi. We can set up a second network to protect this information and both networks would be accessible within the coverage area under different security credentials. If you want to extend WiFi around your property, to a shed out back etc. this can be done also. Air Wifi can extend WiFi signal around your property and give you additional wired points for other PC's, game consoles printers and more. We will assess your property work out the best location extend WiFi in the most aesthetic way as if we were never there. See Connecting Two Building In Different Locations. Click Here.